"Even though you're growing up, you should never stop having fun." I'm not going to lie, I'm a little worse for wear as I'm writing this so it may end up a lot more nonsensical than usual. I had another post in mind for today and was going to include last night in my usual weekly round up My Week In Words. However, it was so epic I thought it deserved a post of it's own! Last night was the Belfast Giants award ceremony. It was the first time I had been to anything of the sort. As the Ramada Plaza Hotel, which the ceremony was being held in, was in Belfast, Eva and I decided to book a room so we wouldn't have to cut the night short so our dad could pick us up. Thankfully my aunt Karen was off for Easter she was able to give us a lift home the next morning. The perks of having a teacher in the family. Welcome to this week's edition of My Week In Words! This post covers from Sunday 22nd to Saturday 28th of March. It's been another great week. I can barely believe we're almost done with another month! I'm looking forward to spring. Anyway, on with this week! "Promise me something Katie, that you’ll take a lot of pictures. You’ll only regret the ones that you didn't take." Welcome to the latest edition of Bloo's Reviews. I've decided to review something a little different today. I'll be reviewing an app I downloaded recently called Polabox. You can check out the website here. I personally used the iPhone app and that's what I'll be reviewing, as well as the product. Polabox is a quick and simple app that lets you print your iPhone photos, as well as your Instagram and Facebook photos and then posts them to you free of charge. The photo are received swiftly and are of great quality and a reasonable price. The app itself is easy to use and pretty to look at. The only downside is it would not accept my maestro card and instead would only accept my credit card. This Oh noes! I've been tagged! is becoming something of a series and I have to say, I feel very flattered that people think of me to nominate me for these tags. I don't want anyone to feel like I don't care because I take a while to post them or because I put them together like this. I love being nominated and I enjoy answering the different questions or coming up with random facts about myself etc. So once again I thank you for these lovely nominations. "Share love, give love, spread love. Measure, measure your life in love." Welcome to My Week In Words! Another hockey and hamster filled week. This post covers from Sunday 15th to Saturday 21st of March. Please enjoy! This week's Arts 'n' Crafts post is a little different. 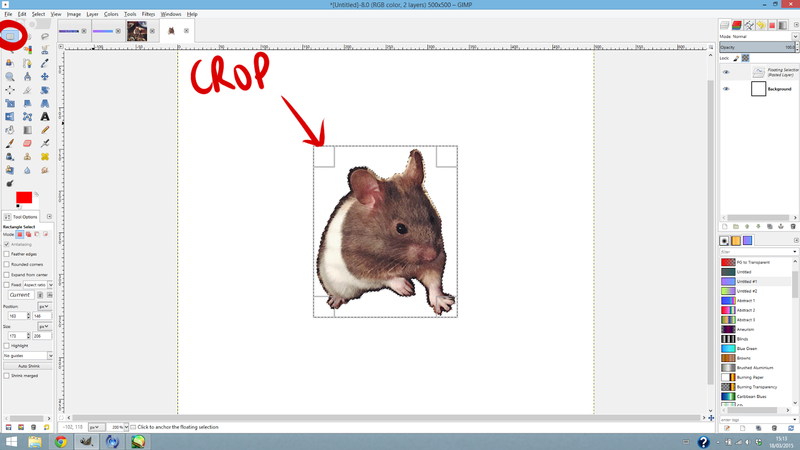 So far I've done the more tangible type of arts and crafts and I had planned to do cross stitching for today's post but as I was putting together a signature for the hamster forum I joined since getting Rue, I decided to do a post about it! 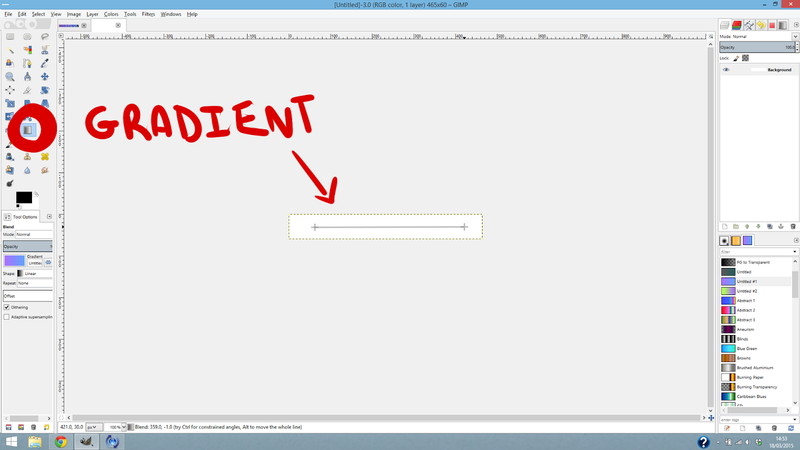 You can probably tell by my blog that I am by no means a whizz when it comes to graphics but I do know some basics. Many of the skills I amassed were from making signatures and the like for different forums I've been apart of over the years. I used to have Photoshop but I now use GIMP which is free. Click the images to see them bigger. Obviously different forums and such have different guidelines for signatures. Some bigger than others. 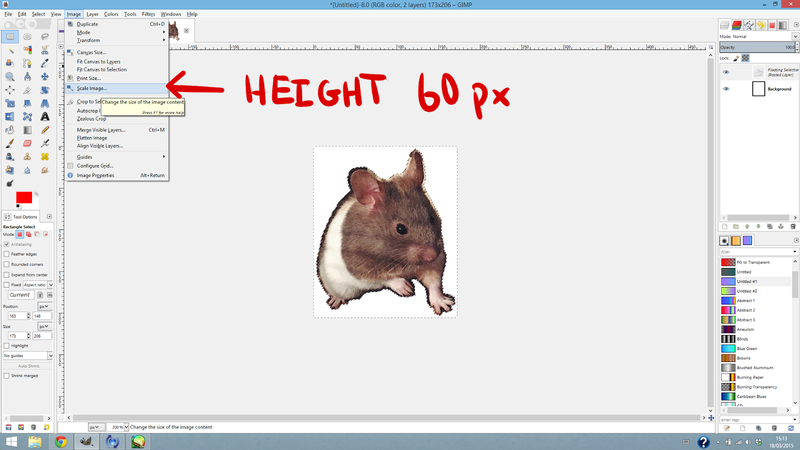 The forum I'll be using this signature on is Hamster Central and their guidelines are a maximum of 465 by 60 pixels or 22.0 KB. Which ever is smaller. This presented a little bit of a challenge as it's smaller than what I'm used to working with. First you want to open a new image at the appropriate size. For the background you can use patterns and such but I decided to go for something clean simple. I went for a gradient background of two of my favourite colours, blue and purple. 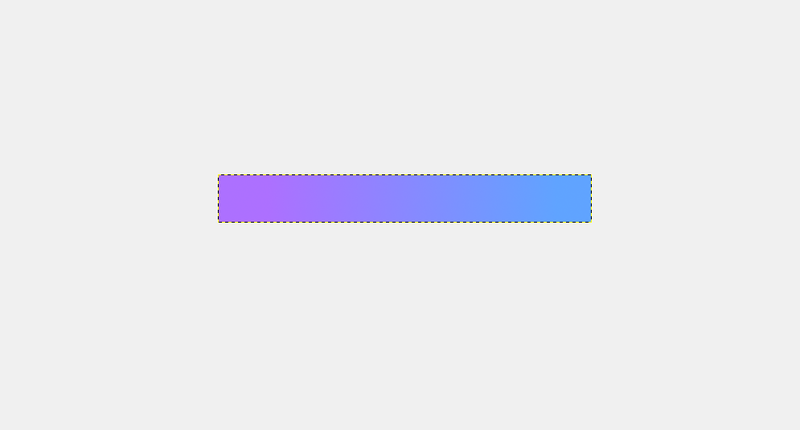 I've highlighted the gradient tool below and basically you pull the line in the direction you want the gradient to go and the length of the line also determines how much the colours will blend. You will be left with something like this. Then you want to move on to the images you'll want to use on your signature. The two I've decided to use are. I won't be using the whole picture but I will be cutting Rue out of them, shrinking her to the appropriate size and pasting on to the signature. 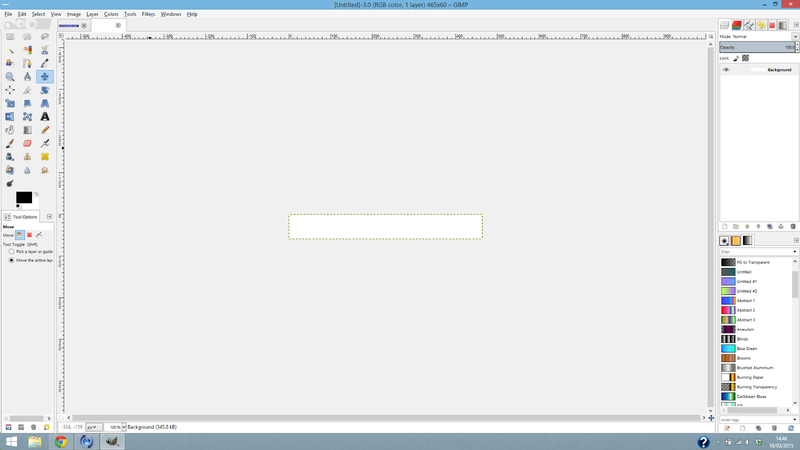 Start by opening the photo in GIMP. 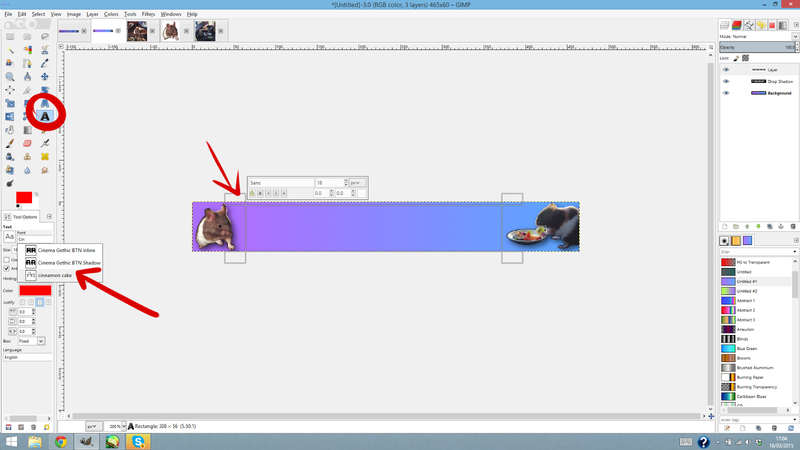 I then use the free select tool, as highlighted in the picture below, to go around her until the line joins up. Once I have her highlighted I go to Edit and then Copy. 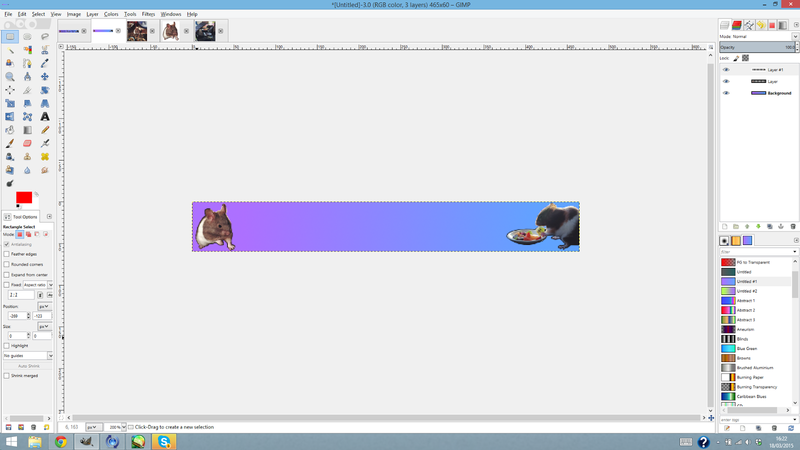 After that I go to File and open a new image and Paste her on to it. Once I have her pasted I highlight her again with a box around her using the rectangle select tool, as seen below, and then go to Image and select Crop to Selection. I wanted the box around her to be as tight as possible because next I'm going to shrink her down so she fits on to the signature. 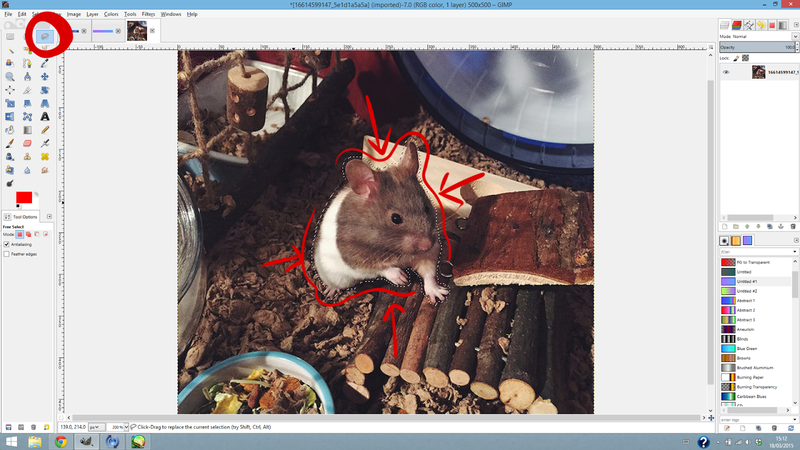 Once she's shrunk down I make sure she's still highlighted and then go to Edit and Copy her again at her new size. 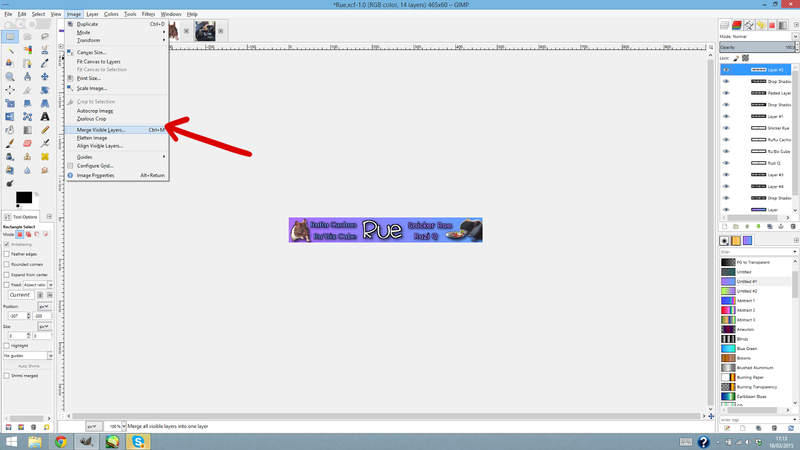 I then go back to my original image of the signature and open a new layer as seen below. 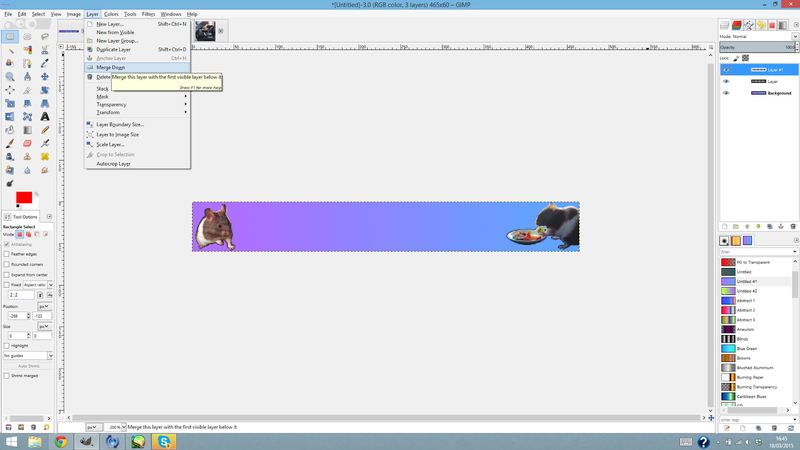 This is so the pasted image has a layer of it's own so we can edit and move it around etc. 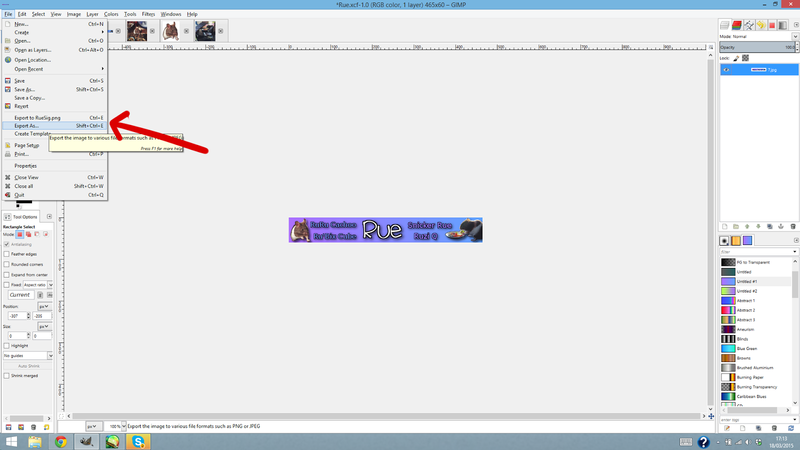 Once I paste the photo on to the new layer on the signature I zoom in to make it easier to see and work with. I wanted to have a picture of her on each side and planned to put her name in the middle. So I moved the first pasted photo using the move tool as seen below. I then repeated the steps above on the second photo, this time deciding to include the little bowl of fruit she's eating from too for some extra colour. I finished up with this. After I had both photos in the positions I wanted them I went to Layer and merged the two photo layers together to make the next step a little more simple. Once I had them merged I wanted to give them a drop shadow, so I went to Filters and then Light and Shadow and then Drop Shadow. 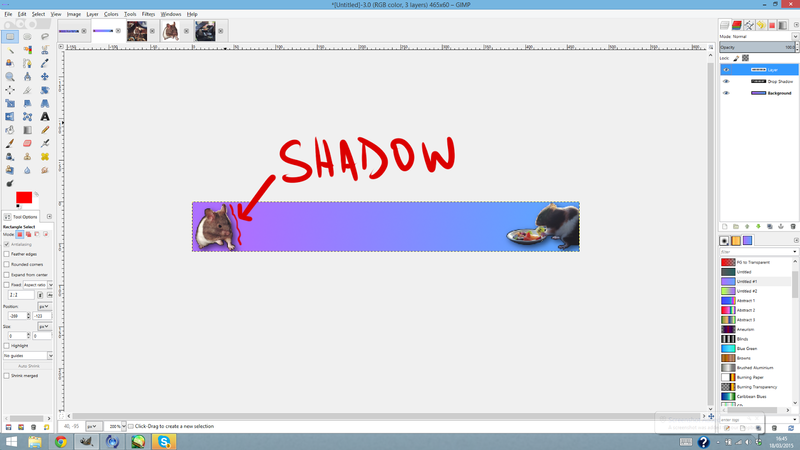 With drop shadow it's really down to personal preference but I tend to stick with a shadow that isn't too dramatic. You can play about with the settings and see what you like but this is what I went for with mine. 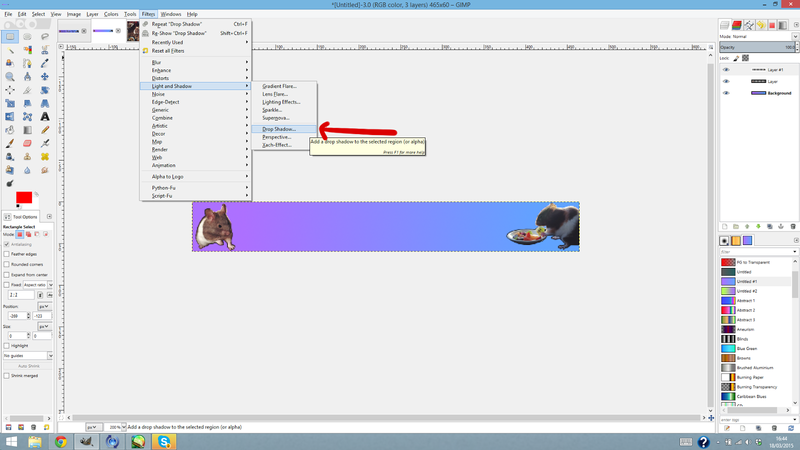 Just make sure you have Allow resizing unchecked or else it may move the layers on you. I finished up with this. As you can see the shadow just makes the photos pop a little. Next I moved on to the text. Again this is very much down to personal preference. The font I decided to go with was Cinnamon Cake but you can find many others that might fit your style better for free at Dafont. 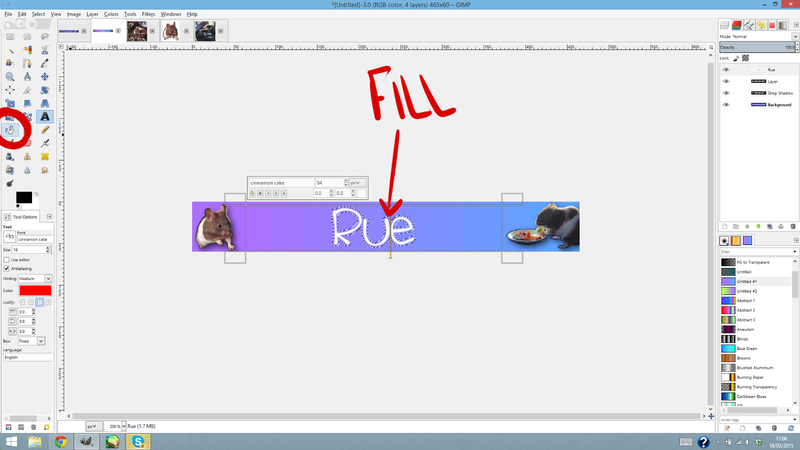 I wanted the text to be near enough in the middle the two Rue photos. 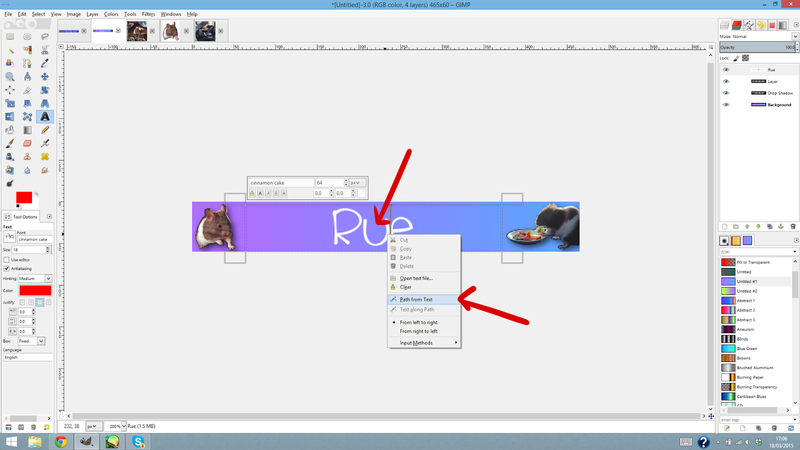 I find the easiest way to do this is to make the text box fit just between whatever you want the text to be in the centre of and as common sense dictates choose the centered text option. 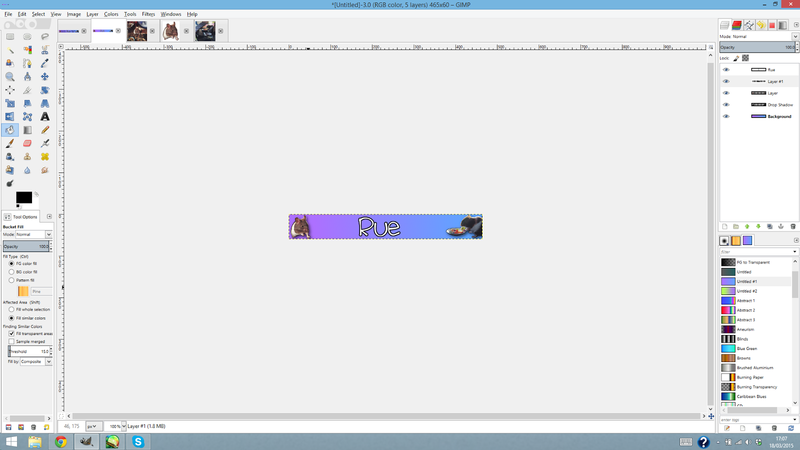 Once I had the text how I wanted it I wanted to give it a boarder. 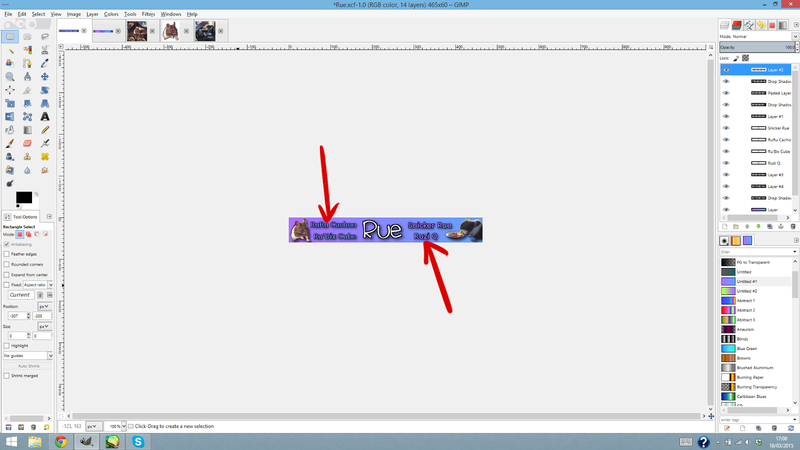 I go about this by right clicking on the text layer and choosing Path from Text as seen below. Then I go to Select at the top and to where it says From Path. 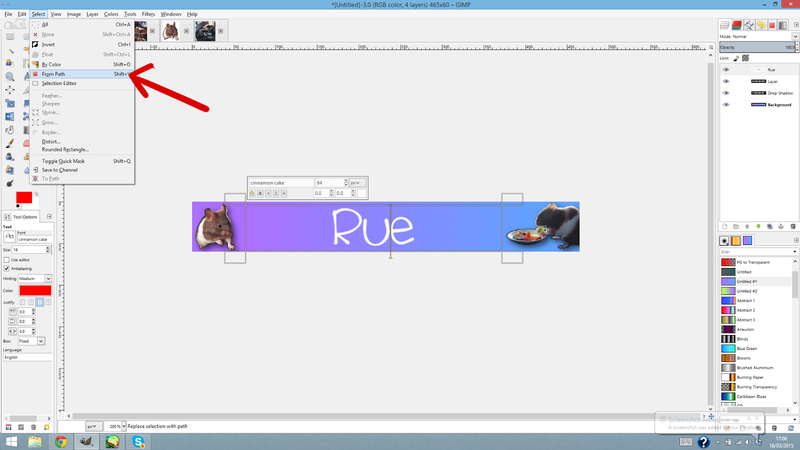 This will highlight around the text much the same way I highlighted around the photo of Rue. To be able to give the text a boarder we have to make the select bigger. So once again I go to Select but this time down to Grow. Again this is up to personal preference. You can make the boarder whatever colour you want and as thick as you want. 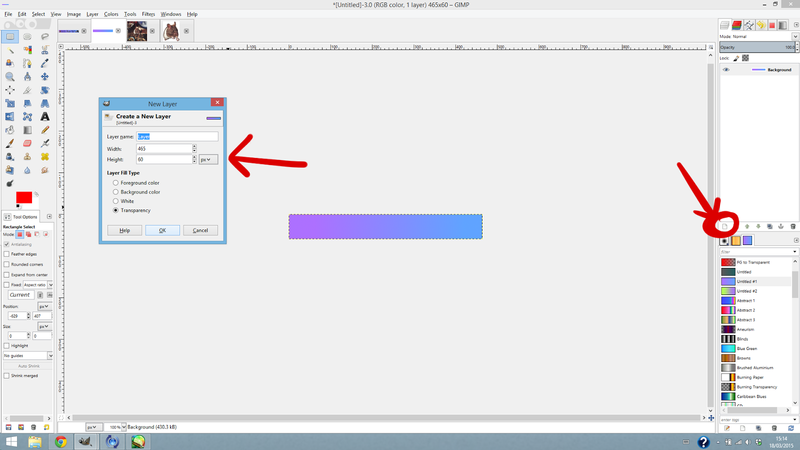 It will bring up a little box and you say how many pixels you want to grow the select. For this particular one I picked 2 pixels. I then selected the Bucket Fill Tool as circled below, made a new layer beneath the text layer and filled the selection in with black on that new layer. 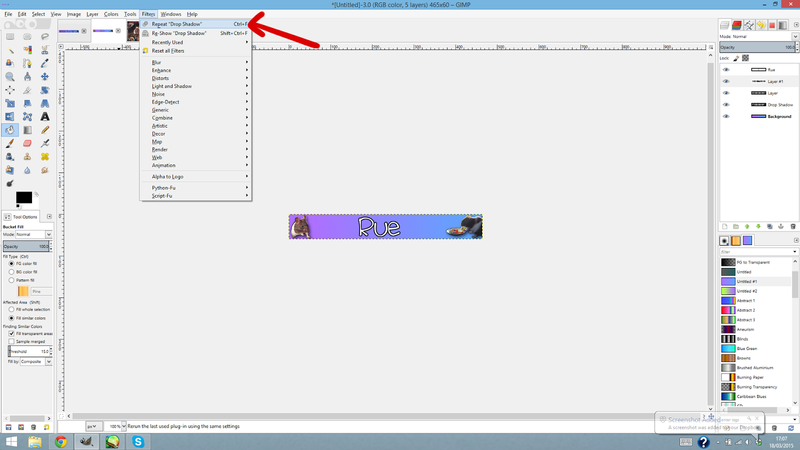 Now you can see the boarder around the text. Again this just makes it pop a little more. The final touch I make to the text is another drop shadow. As I've already used it I can go to Filter and click on repeat and it will repeat the drop shadow as the same settings as before. If you want it to be a little different then repeat the steps the same as the last time and fiddle with the settings until you have it how you want it. Finally I decided to add some more text, repeating the steps above but this time I made the text a different font, colour and have a smaller boarder. The text I added was Rue's nicknames. Perhaps when I have more clear photos of her to work with I may add them instead. Once I was happy with how everything was set out and was sure I was finished I went to Image and then Merge Visible Layers. 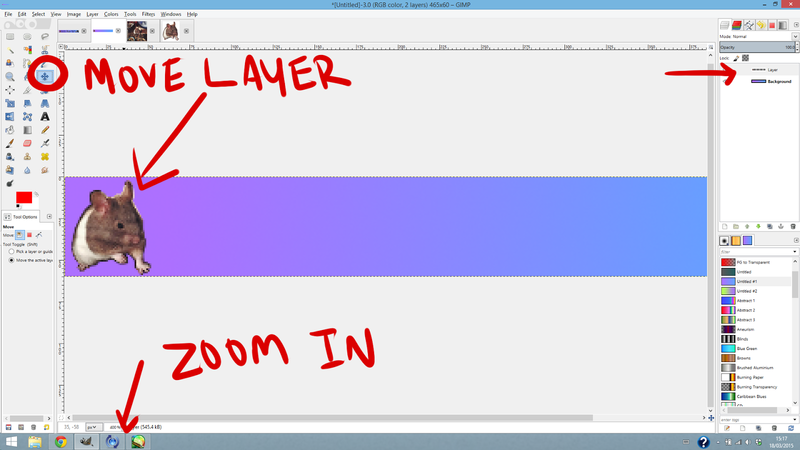 It will bring up a box and to be honest I'm not sure what difference it makes but I just check clipped to bottom layer. Now all that is left to do is save the signature! 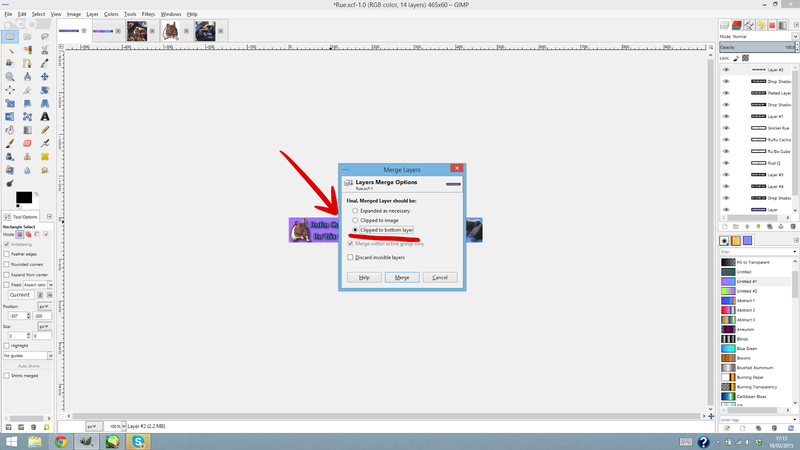 However, rather than going to save as you instead go to File and then Export As. And then just continue the steps like you would saving anything else. I personally save mine as png's but it's up to you. And there you have it. 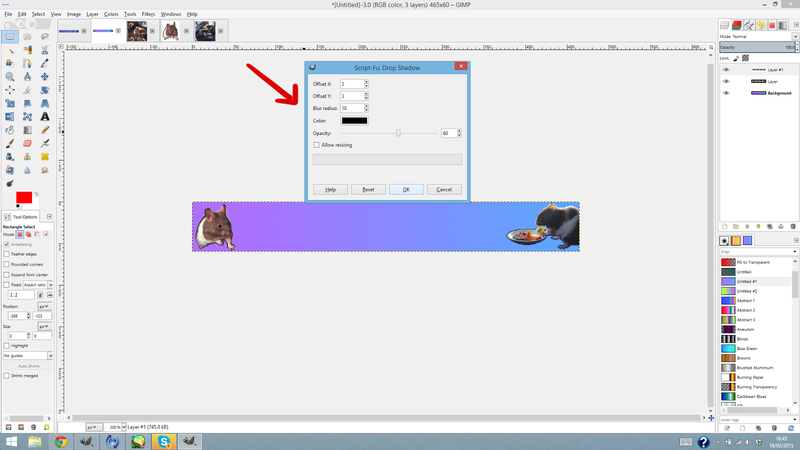 My super simple hammie forum signature. Now I'm sure this isn't the only way to go about things but this is just how I do it personally. This can be used for banners for Facebook pages, YouTube or even your blog. Anyway, I hope you enjoyed this digital arts and crafts post. If you did please let me know and I'll do more in the future. I'm a firm believer in the power of music and it's ability to influence our mood. Well I know it has an impact on mine for sure. When I'm at my lowest I know I can put on certain songs and they will help set me on the path to feeling better, whether that's by cheering me up with their encouraging lyrics, their fun beat or by helping me get the boohoos out. Often when we don't know what to say or do to vent how we feel the lyrics put into words what we cannot. While I know we all have our own go to songs for this I thought I would share some of my own favourites in today's post. I decided to list five I listen to to cheer me up and five I listen to to help me wallow and get the boohoo's out of my system. I also included some of the lyrics I connect with most from each song. "Bad shopping habits die hard." Welcome to My Week In Words! 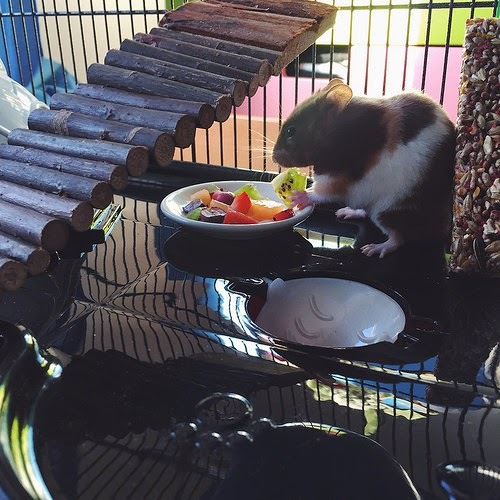 I had a great week full of hamster fun! I hope you're not bored of hearing about her yet! This post covers from Sunday 8th to Saturday 14th of March. Enjoy! On Sunday I woke up to a fry up courtesy of my dad. Oh it was a good'un. I left Rue to sleep and settle in most of the day. I kept my bedroom door closed because the dogs were, and still kind of are, completely obsessed by her. 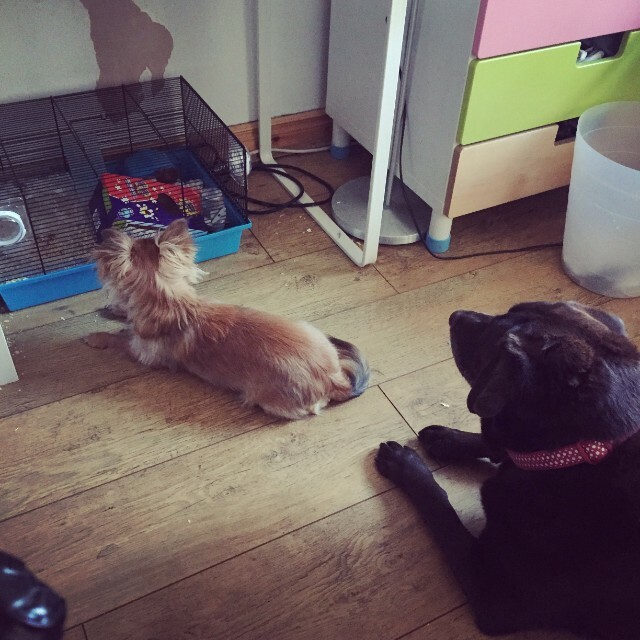 They just sat staring at the cage much like this. Luckily she doesn't seem to phased by them but I still didn't want them bothering her. During the day I worked on last week's My Week In Words post and decided to make Saturday it's own post. I figured Rue deserved a post of her own about the day I got her! Eva went out for cocktails with a friend, but she was back in time for our aunt Karen visiting for our weekly catch up. After she left we found a stream of Crufts online and got into bed with our chihuahua boys to watch Best In Show. Personally I was rooting for the Saluki, one of my favourite breeds, and Eva wanted the Maltese to win. We didn't like the handler of the terrier that ended up winning. I guess we were right now to after a lot of people called for her Best In Show to be revoked for how she handled her dog. After Crufts we got up to have our first proper bonding session with our hamsters. I know you're supposed to leave them for two or three days but we couldn't help ourselves and they were already very social and friendly little women. The chihuahua boys felt their nose put out of joint a little as they're not used to sharing our attention but that's gotten better throughout the week. After some bonding time we watched some hamster videos on YouTube while we ate supper. I'm obsessed by the channel Erin's Animals. 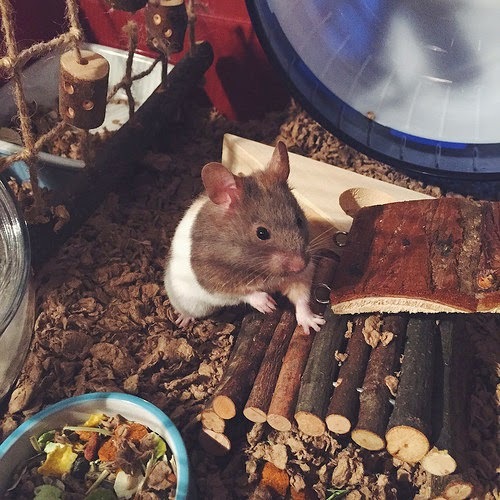 On Sunday I also ordered a new cage from Zooplus and some other goodies for Rue's cage. "You're beautiful when you're jealous." A while ago I watched Noordzee, Texas or North Sea Texas on Netflix. I have to say I really enjoyed it. It’s a Belgian movie and the first feature film from director Bavo Defurne. It's based on a children’s novel by Andre Sollie and follows the story of Pim who falls in love with his older best friend Gino. Pim lives with his neglectful mother and from a young age spends time at Gino’s house with Gino, his caring mother and Gino’s younger sister who develops feelings for Pim, unaware at first of what is going on between he and her brother. This is a very slow paced and understated movie, which is probably more emphasised by the predictability of the plot. That probably sounds like a criticism, but personally I enjoyed it partly for that fact. I understand other’s might find that boring, but sometimes I prefer to watch a neat little package of a movie that will deliver exactly what I expect with great acting and cinematography. Which is something I definitely can’t fault in this movie. It was beautiful to look at. I would really recommend this movie to anyone that is interested in LGBT subject matter, foreign films or someone who wants something beautiful and easy to watch. Obviously if you like big drama and plot twists, this probably isn’t for you. Still I think I would probably watch it again, which is probably mostly credited to the chemistry and talent of the young actors playing Pim (Jelle Florizoone) and Gino (Mathias Vergals) which other than the cinematography really made the movie for me. 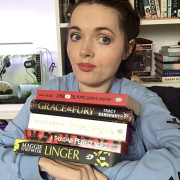 So usually Saturday would be included in My Week In Words but Saturday 7th of March was such a big and special day that I felt it needed a post all of it's down. The special little lady I'm about to introduce to you deserved a post all of her own. So on with the story! "Determination becomes obsession and then it becomes all that matters." Welcome to My Week In Words! It was another big week. This post covers from Sunday 1st to Friday 6th of March. I can't believe we're into a new month already! You've probably noticed I'm not covering Saturday like I usually do in My Week In Words. That is because Saturday was such a big and special day that I wanted to give it a post all of it's own. There is a link to it at the bottom of this post. Enjoy! To say I messed up this post is a little bit of an understatement. I may have underestimated how long this craft would take me to do and then when I was rushing to get it finished before I had to get ready for class, I forgot to take photos as I went along. So I apologise for this slightly rubbish post. Still, better late than never. Today's craft is another I stole from my mother who downloaded the pattern from Etsy. It's a crochet caravan keyring. Since my mum had to buy it I'm not going to share the pattern in this post but I will link it if you're interested in making these. They are super simple to make and look really cute. The pattern is £2.50 so it's not really that expensive at all. Howdy and welcome to this week's Miscellaneous Tuesday post, Bucket List Reveal! I've wanted to make a bucket list for a long time. I've had many things on it for a long while but just never took the time to write it down. I had thought about doing a 30 before 30 list but I didn't like the idea of putting such a time constraint on it. So I decided to go for the traditional things to do before I die bucket list. A while ago someone gave me the idea to make it a page on my blog and I'm finally getting around to it now. You can find that page here. However I decided reveal the list on today's blog also! So far there are 109 things on the list, some of which I've already done. I know that's technically cheating but they're all things that were always part of my mental bucket list but I ticked off before I actually got around to writing or, I guess, typing it out. I tried to dream big and while I do believe in the go big or go home motto, I tried to keep the list to things that I feel are achievable. I know 109 seems like a weird number to finish on. I had originally aimed for 100 but the extra ones just came to me. I look forward to checking each off as I go and adding more in the future. I'm welcome to ideas. Now on to the list so far! Welcome to this week's instalment of My Week In Words! Another week full of treating myself as well as my furry babies! This week's edition covers from Sunday the 22nd to Saturday the 28th of February. Another month of 2015 down!